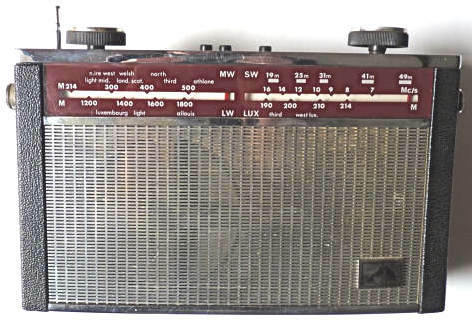 This was one of several radios given to me by Michael Marwood. 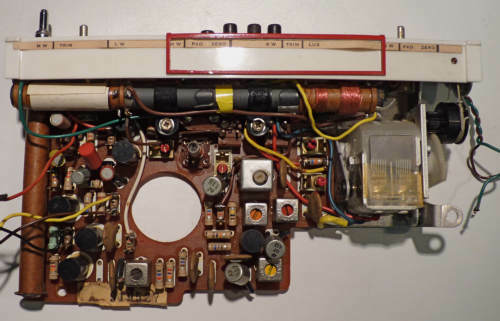 It has an intermittent fault and failed to work when first energised, but it was apparent that the output stages were functioning as an aerial touched on the detector diode produced an audio signal. 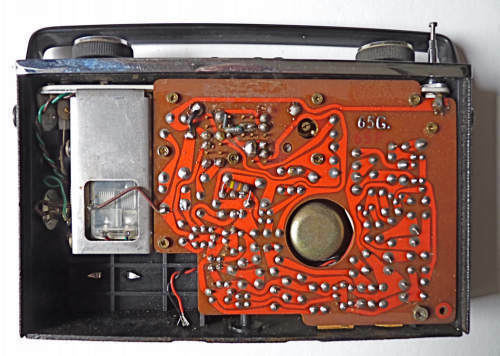 I removed the screen connection to each of the Mullard AF transistors and the radio burst into life for a few seconds but then went silent. Knocking the AF117 near the bottom edge of the board brought it back to life but again not for long. The offender this time was traced to the oscillator/mixer transistor TR1 (AF115). I attacked this one by temporarily soldering together the base, emitter and collector connections on the printed circuit and applying about 30 volts between this point and the transistor case. Again this was only a temporary fix, the set worked for a while then went silent. Component side of printed circuit board, the three larger transistors are the Mullard AF 115 and AF117's which tend to be troublesome. Note the way that the scale pointers have been cleverly extended to travel across a calibrated paper strip to facilitate alignment. 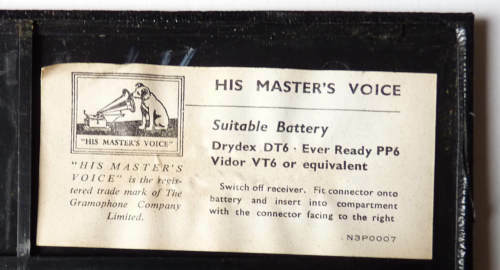 This is a close up view of the back panel indicating that a 9 volt PP6 or equivalent battery is required. These are difficult to come by though equivalents can be obtained for a substantial sum from specialist battery suppliers. The readily available PP3 can be used instead though being smaller will rattle around!